What is an 8x10 unit? A unit is an uncut sheet of photographic paper sized 8 inches x 10 inches containing one image or a cluster of images such as eight (8) wallets. 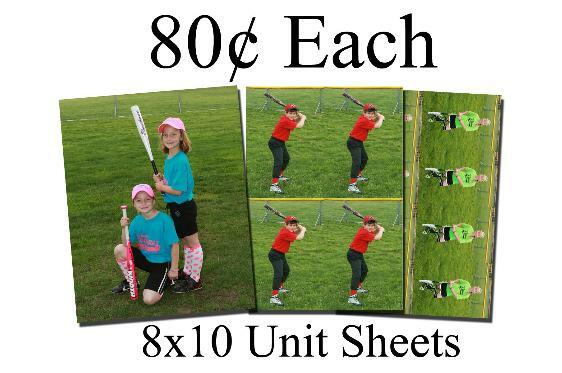 An 8x10 Memory Mate is a sports or an event theme composite with a 3.5x5 individual pose with a 5x7 team pose also priced at $.80 ea. Minimum order is $40.00 ($.80 x 50). For non-unit orders, please use regular pricing. Templates are ready to use in ROES for multiple unit configurations. Packaging Prints are packaged per team or group not per individual player, dancer, etc. For large sports leagues or events please Email DPP prior to submitting your order(s). Individualized packaging per individual is available upon request at an additional price. Please Email DPP customer service for more information. All Unit 8x10 Photo Sheets $.80 each. To Order use the Photo Product Catalog, Team Sports and Events Tab)..
Sports and Event photography is a high growth niche market. Economical volume pricing for orders consisting of a minimum of 50 or more 8x10 unit prints of sports or event images submitted at same time is $. 80 per 8x10 unit. All images will be printed as submitted, your cropping, and will receive a Lab batch correction for density and color. If you wish to apply your own color & density preference, please advise us in advance prior to submitting your order. Our lab technicians will notify you if they foresee any potential problem with your order.